Guru Tegh Bahadur (Punjabi: ਗੁਰੂ ਤੇਗ਼ ਬਹਾਦਰ, Punjabi pronunciation: [ɡʊru teɣ bəhɑdʊɾ]; 1 April 1621 – 24 November 1675,), revered as the ninth Nanak, was the ninth of ten Gurus of the Sikh religion. Guru Tegh Bahadur continued in the spirit of the first guru, Nanak; his 115 poetic hymns are in the text Guru Granth Sahib. Guru Tegh Bahadur resisted the forced conversions of Kashmiri Pandits to Islam, and was publicly beheaded in 1675 on the orders of Mughal emperor Aurangzeb in Delhi for refusing to convert to Islam. Gurudwara Sis Ganj Sahib and Gurdwara Rakab Ganj Sahib in Delhi mark the places of execution and cremation of the Guru's body. Guru Tegh Bahadur was born in a Sodhi Family. The Sixth guru, Guru Hargobind had one daughter Bibi Viro and five sons: Baba Gurditta, Suraj Mal, Ani Rai, Atal Rai and Tyaga Mal. Tyaga Mal was born in Amritsar in the early hours of 1 April 1621, who came to be known by the name Tegh Bahadur (Mighty Of The Sword), given to him by Guru Hargobind after he had shown his valour in a battle against the Mughals. Amritsar at that time was the centre of Sikh faith. As the seat of the Sikh Gurus, and with its connection to Sikhs in far-flung areas of the country through the chains of Masands or missionaries, it had developed the characteristics of a state capital. Guru Tegh Bahadur was brought up in Sikh culture and trained in archery and horsemanship. He was also taught the old classics. He underwent prolonged spells of seclusion and contemplation. Tegh Bahadur was married on 3 February 1633, to Mata Gujri. In the 1640s, nearing his death, Guru Hargobind said to his wife Nanaki, to move to his ancestral village of Bakala in Amritsar district, together with Guru Tegh Bahadur and Mata Gujri. Bakala, as described in Gurbilas Dasvin Patishahi, was then a prosperous town with many beautiful pools, wells and baolis. Guru Tegh Bahadur meditated at Bakala for about 26 years 9 months 13 days and lived there with his wife and mother. He spent most of his time in meditation, but was not a recluse, and attended to family responsibilities. He made visits outside Bakala, and also visited the eighth Sikh guru Guru Har Krishan, when the latter was in Delhi. In March 1664 Guru Har Krishan contracted smallpox. When asked by his followers who would lead them after him, he replied Baba Bakala, meaning his successor was to be found in Bakala. Taking the advantage of the ambiguity in the words of the dying Guru, many installed themselves as the new Guru. Sikhs were puzzled to see so many claimants. The Sikh tradition has a legend on how Guru Tegh Bahadur was found and chosen as the ninth guru. A wealthy trader, Baba Makhan Shah Labana, had once prayed for his life and had promised to gift 500 gold coins to the Sikh guru if he survived. He arrived in search of the ninth Guru. He went from one claimant to the next making his obeisance and offering two gold coins to each Guru, believing that the right guru would know that his silent promise was to gift 500 coins for his safety. Every "guru" he met accepted the 2 gold coins and bid him farewell. Then he discovered that Guru Tegh Bahadur, who also lived at Bakala. Labana gifted Tegh Bahadur the usual offering of two gold coins. Tegh Bahadur gave him his blessings and remarked that his offering was considerably short of the promised five hundred. Makhan Shah Labana forthwith made good the difference and ran upstairs. He began shouting from the rooftop, "Guru ladho re, Guru ladho re" meaning "I have found the Guru, I have found the Guru". In August 1664 a Sikh Sangat arrived in Bakala and anointed Tegh Bahadur as the ninth guru of Sikhs. The Sangat was led by Diwan Durga Mal, and a formal "Tikka ceremony" was performed by Bhai Gurditta on Tegh Bahadur conferring Guruship on him. As had been the custom among Sikhs after the execution of Guru Arjan by Mughal Emperor Jahangir, Guru Tegh Bahadur was surrounded by armed bodyguards. He himself lived an austere life. He contributed many hymns to the Guru Granth Sahib including the Saloks, or couplets near the end of the Guru Granth Sahib. Guru Tegh Bahadur toured various parts of Mughal Empire, and was asked by Gobind Sahali to construct several Sikh temples in Mahali. His works include 116 shabads, 15 ragas and his bhagats are credited with 782 compositions that are part of bani in Sikhism. One who is not perturbed by misfortune, who is beyond comfort, attachment and fear, who considers gold as dust. He neither speaks ill of others nor feels elated by praise and shuns greed, attachments and arrogance. He is indifferent to ecstasy and tragedy, is not affected by honors or humiliations. He renounces expectations, greed. He is neither attached to the worldliness, nor lets senses and anger affect him. In such a person resides God. Guru Tegh Bahadur travelled extensively in different parts of the country, including Dhaka and Assam, to preach the teachings of Nanak, the first Sikh guru. The places he visited and stayed in, became sites of Sikh temples. During his travels, Guru Tegh Bahadur spread the Sikh ideas and message, as well as started community water wells and langars (community kitchen charity for the poor). The Guru made three successive visits to Kiratpur. On 21 August 1664, Guru went there to console with Bibi Rup upon the death of her father, Guru Har Rai, the seventh Sikh guru, and of her brother, Guru Har Krishan. The second visit was on 15 October 1664, at the death on 29 September 1664, of Bassi, the mother of Guru Har Rai. A third visit concluded a fairly extensive journey through northwest Indian subcontinent. His son Guru Gobind Singh, who would be the tenth Sikh guru, was born in Patna, while he was away in Dhubri, Assam in 1666, where stands the Gurdwara Sri Guru Tegh Bahadur Sahib. He there helped end the war between Raja Ram Singh of Bengal and Raja Chakardwaj of Ahom state (later Assam). He also visited the towns of Mathura, Agra, Allahabad and Varanasi. After his visit to Assam, Bengal and Bihar, the Guru visited Rani Champa of Bilaspur who offered to give the Guru a piece of land in her state. The Guru bought the site for 500 rupees. There, Guru Tegh Bahadur founded the city of Anandpur Sahib in the foothills of Himalayas. In 1672 Guru Tegh Bahadur traveled through Kashmir and the North-West Frontier, to meet the masses, as the persecution of non-Muslims reached new heights. Gurudwara Sisganj Sahib in Delhi. The long window under the marble platform is the location where Guru Tegh Bahadur was martyred. In 1675 Guru Tegh Bahadur was executed in Delhi on 11 November under the orders of the Mughal Emperor Aurangzeb. No contemporary detailed accounts of the circumstances of his arrest and execution have survived either in Persian or Sikh sources. The only accounts available are those written about a 100 years later, and these accounts are conflicting. Tegh Bahadur, the eighth successor of (Guru) Nanak became a man of authority with a large number of followers. (In fact) several thousand persons used to accompany him as he moved from place to place. His contemporary Hafiz Adam, a faqir belonging to the group of Shaikh Ahmad Sirhindi's followers, had also come to have a large number of murids and followers. Both these men (Guru Tegh Bahadur and Hafiz Adam) used to move about in the Punjab, adopting a habit of coercion and extortion. Tegh Bahadur used to collect money from Hindus and Hafiz Adam from Muslims. The royal waqia navis (news reporter and intelligence agent) wrote to the Emperor Alamgir [Aurangzeb] of their manner of activity, added that if their authority increased they could become even refractory. Satish Chandra cautions that this was the "official justification", which historically can be expected to be full of evasion and distortion to justify official action. Another Muslim scholar, Ghulam Muhiuddin Bute Shah wrote his Tarikh-i-Punjab in 1842, over a century and half after the death of Guru Tegh Bahadur, saying that there was ongoing hostility from Ram Rai, the elder brother of Guru Har Kishan, against Guru Tegh Bahadur. Ghulam Muhiuddin Bute Shah said that "Ram Rai represented to the Emperor that Guru Tegh Bahadur was very proud of his spiritual greatness and that he would not realise his fault unless he was punished. Ram Rai also suggested that Guru Tegh Bahadur be asked to appear before the Emperor to work a miracle, if he failed, he could be put to death." Satish Chandra and others say that this account is also doubtful as to the circumstances or cause of Guru Tegh Bahadur's execution. Sikh historians record that Guru Tegh Bahadur had become a socio-political challenge to the Muslim rule and Aurangzeb. The Sikh movement was rapidly growing in the rural Malwa region of Punjab, and the Guru was openly encouraging Sikhs to, "be fearless in their pursuit of just society: he who holds none in fear, nor is afraid of anyone, is acknowledged as a man of true wisdom", a statement recorded in Adi Granth 1427. While Guru Tegh Bahadur influence was rising, Aurangzeb had imposed Islamic laws, demolished infidel schools and temples, and enforced new taxes on non-Muslims. The main substantive record however comes from Guru Tegh Bahadur's son, Guru Gobind Singh in his composition, Bachittar Natak. This composition is recited in every Sikh place of worship on the occasion of the Guru's martyrdom. According to records written by his son Guru Gobind Singh, the Guru had resisted persecution, adopted and promised to protect Kashmiri Hindus. The Guru was summoned to Delhi by Aurangzeb on a pretext, but when he arrived, he was offered, "to abandon his faith, and convert to Islam". Guru Tegh Bahadur refused, he and his associates were arrested. He was executed on 11 November 1675 before public in Chandni Chowk, Delhi. William Irvine states that Guru Tegh Bahadur was tortured for many weeks while being asked to abandon his faith and convert to Islam; he stood by his convictions and refused, he was then executed. Sikh tradition teaches that the associates of the Guru were also tortured for refusing to convert: Bhai Mati Das was sawed into pieces and Bhai Dayal Das was thrown into a cauldron of boiling water, while Guru Tegh Bahadur was held inside a cage to watch his colleagues suffer. The Guru himself was beheaded in public. Guru Har Gobind was Guru Tegh Bahadur's father. He was originally named Tyag Mal (Punjabi: ਤਿਆਗ ਮਲ) but was later renamed Tegh Bahadur after his gallantry and bravery in the wars against the Mughal forces. He built the city of Anandpur Sahib, and was responsible for saving the Kashmiri Pandits, who were being persecuted by the Mughals. After the execution of Guru Tegh Bahadar by Mughal Emperor Aurangzeb, a number of Sikh temples were built in his and his associates' memory. The Gurdwara Sis Ganj Sahib in Chandni Chowk, Delhi, was built over where he was beheaded. Gurdwara Rakab Ganj Sahib, also in Delhi, is built on the site of the residence of a disciple of Teg Bahadur, who burnt his house in order to cremate his master's body. Gurdwara Sisganj Sahib in Punjab marks the site where in November 1675, the head of the martyred Guru Teg Bahadar which was brought by Bhai Jaita (renamed Bhai Jivan Singh according to Sikh rites) in defiance of the Mughal authority of Aurangzeb was cremated here. Guru Tegh Bahadur has been remembered for giving up his life for freedom of religion, reminding Sikhs and non-Muslims in India to follow and practice their beliefs without fear of persecution and forced conversions by Muslims. Guru Tegh Bahadur was martyred, along with fellow devotees Bhai Mati Dass, Bhai Sati Das and Bhai Dayala. 24 November, the date of his martyrdom, is celebrated in certain parts of India as a public holiday. The execution hardened the resolve of Sikhs against Muslim rule and the persecution. Pashaura Singh states that, "if the martyrdom of Guru Arjan had helped bring the Sikh Panth together, Guru Tegh Bahadur's martyrdom helped to make the protection of human rights central to its Sikh identity". Wilfred Smith states that, "the attempt to forcibly convert the ninth Guru to an externalized, impersonal Islam clearly made an indelible impression on the martyr's nine year old son, Gobind, who reacted slowly but deliberately by eventually organizing the Sikh group into a distinct, formal, symbol-patterned community". It inaugurated the Khalsa identity. A number of places are named after the ninth guru of Sikhs, Guru Teg Bahadur. Gurdwara Sri Guru Tegh Bahadur Sahib, Assam. Teja Singh Ganda Singh; A Short History of the Sikhs. 1 2 3 4 5 6 7 8 9 10 Pashaura Singh and Louis Fenech (2014). The Oxford handbook of Sikh studies. Oxford, UK: Oxford University Press. pp. 236–445, Quote:"this second martyrdom helped to make 'human rights and freedom of conscience' central to its identity." Quote:"This is the reputed place where several Kashmiri pandits came seeking protection from Auranzeb's army.". ISBN 978-0-19-969930-8. ↑ Gill, Sarjit S., and Charanjit Kaur (2008), "Gurdwara and its politics: Current debate on Sikh identity in Malaysia", SARI: Journal Alam dan Tamadun Melayu, Vol. 26 (2008), pages 243-255, Quote: "Guru Tegh Bahadur died in order to protect the Kashmiri Hindus' religious freedom." 1 2 3 4 5 6 7 8 9 Seiple, Chris (2013). The Routledge handbook of religion and security. New York: Routledge. p. 96. ISBN 978-0-415-66744-9. 1 2 3 4 Gandhi, Surjit (2007). History of Sikh gurus retold. Atlantic Publishers. pp. 653–91. ISBN 978-81-269-0858-5. ↑ Pechilis, Karen; Raj, Selva J. (2013). South Asian Religions: Tradition and Today. Routledge. p. 228. ISBN 9780415448512. Retrieved 17 November 2016. ↑ W. H. McLeod (1984). Textual Sources for the Study of Sikhism. Manchester University Press. pp. 31–33. Retrieved 14 November 2013. ↑ "The Ninth Master Guru Tegh Bahadur (1621 - 1675)". 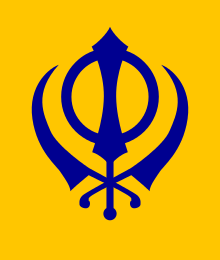 sikhs.org. Retrieved 23 November 2014. 1 2 3 4 "Religions - Sikhism: Guru Tegh Bahadur". BBC. Retrieved 20 October 2016. 1 2 H. S. Singha (2000). The Encyclopedia of Sikhism (over 1000 Entries). Hemkunt Press. p. 169. ISBN 978-81-7010-301-1. ↑ Nabha, Kahan. Mahan Kosh. ↑ William Owen Cole; Piara Singh Sambhi (1995). The Sikhs: Their Religious Beliefs and Practices. Sussex Academic Press. pp. 34–35. ISBN 978-1-898723-13-4. ↑ Smith, Bonnie (2008). The Oxford encyclopedia of women in world history. Oxford, New York: Oxford University Press. p. 410. ISBN 978-0-19-514890-9. 1 2 Gandhi, Surjit (2007). History of Sikh gurus retold. Atlantic Publishers. pp. 621–22. ISBN 978-81-269-0858-5. 1 2 3 4 Kohli, Mohindar (1992). Guru Tegh Bahadur: testimony of conscience. Sahitya Akademi. pp. 13–15. ISBN 978-81-7201-234-2. ↑ H.R. Gupta. History of the Sikhs: The Sikh Gurus, 1469-1708. 1. p. 188. ISBN 9788121502764. ↑ Singh, Prithi (2006). The history of Sikh gurus. Lotus Press. p. 170. ISBN 978-81-8382-075-2. 1 2 Singh, Prithi (2006). The history of Sikh gurus. Lotus Press. pp. 187–89. ISBN 978-81-8382-075-2. ↑ Kohli, Mohindar (1992). Guru Tegh Bahadur: testimony of conscience. Sahitya Akademi. pp. 25–27. ISBN 978-81-7201-234-2. ↑ Singh, Prithi (2006). The history of Sikh gurus. Lotus Press. pp. 121–24. ISBN 978-81-8382-075-2. 1 2 3 4 5 Chandra, Satish. "Guru Tegh Bahadur's martyrdom". The Hindu. Retrieved 20 October 2016. ↑ H.R. Gupta. History of the Sikhs: The Sikh Gurus, 1469-1708. 1. ISBN 9788121502764. ↑ Mir, Farina (2010). The social space of language vernacular culture in British colonial Punjab. Berkeley: University of California Press. p. 36. ISBN 978-0-520-26269-0. ↑ Mir, Farina (2010). The social space of language vernacular culture in British colonial Punjab. Berkeley: University of California Press. pp. 207–37. ISBN 978-0-520-26269-0. ↑ William Irvine (2012). Later Mughals. Harvard Press. ISBN 9781290917766. ↑ Siṅgha, Kirapāla (2006). Select documents on Partition of Punjab-1947. National Book. p. 234. ISBN 978-81-7116-445-5. ↑ Singh, Prithi (2006). The history of Sikh gurus. Lotus Press. p. 124. ISBN 978-81-8382-075-2. ↑ SS Kapoor. The Sloaks of Guru Tegh Bahadur & The Facts About the Text of Ragamala. pp. 18–19. ISBN 978-81-7010-371-4. ↑ Gandhi, Surjit (2007). History of Sikh gurus retold. Atlantic Publishers. p. 690. ISBN 978-81-269-0858-5. ↑ "Letter from Administration of Dadra and Nagar Haveli, U.T." (PDF). Dnh.nic.in. Retrieved 20 October 2016. ↑ "LIST OF RESTRICTED HOLIDAYS 2016". Arunachalipr.gov.in. Retrieved 20 October 2016. ↑ "HP Government - Holidays - Government of Himachal Pradesh, India". Himachal.nic.in. 13 June 2016. Retrieved 20 October 2016. 1 2 Wilfred Smith (1981). On Understanding Islam: Selected Studies. Walter De Gruyter. p. 191. ISBN 978-9027934482. DiscoverSikhism - Sri Guru Tegh Bahadur Ji Sri Guru Tegh Bahadur is the ninth of the Ten Sikh Gurus. Read about his life and stories here.